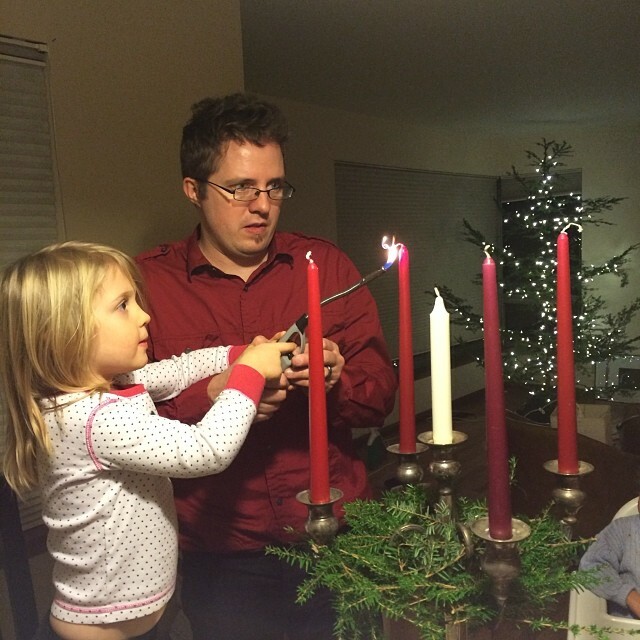 Our granddaughter Sarina lights the candle of hope with her dad Christian on December 1, 2013. Katie and I had a quiet dinner tonight, still grateful for left-over turkey. There were four candles on the table, but only one was lit. It is the first week of Advent and, if you let it, every meal can be turned to worship. We have much to be grateful for and humbled by. And one thing we are especially aware of is God’s work in the lives of our adult children. I don’t mean by this that they turned out the way we wanted them to. Thank goodness. What I mean is that we can rest in the work God is doing in their lives, even when we can’t explain it or even see it. And there was a glimpse of that this week. Since they have left home (all of them live in other states) we have maintained two traditions: Christmas stockings for them, their spouses, and children, and an Advent calendar and a Christmas ornament for each person that arrives in time to open the fourth Sunday before Christmas. I called the married ones Sunday to talk about the stockings. We were wondering if it was an idea better left to each home. We were wondering if they needed less clutter and would appreciate a single, more substantial gift instead. And I was not surprised to find they enjoyed the stockings very much. Michael, in Chicago, said he enjoyed opening them and finding something he “didn’t know he wanted or needed.” But they thought the stockings were more a communal experience, one that meant more in the context of everyone opening them together, part of the tradition at our house. What was surprising—and encouraging—was that without solicitation they all said Advent meant more to them than the stockings. And it made my heart glad. Opening a gift, lighting a candle, or opening the first door of an Advent calendar, Sunday night all of them had a moment something like our moment, an awareness that something wonderful is about to happen, and it connects them to a larger tradition of faithful people who prepare themselves for the coming of the Lord. This is so much more important than finding a stapler in your stocking. Advent was a part of the experience we gave them as children, although neither Katie or I grew up in a home with any liturgical bent. We found it necessary and important, however, to use this celebration in our home as a time for both worship and hospitality. It helped us slow down and look forward to the coming of the Christ child. It often just helped us slow down. So we have decided against stockings this year. With nine grand kids the logistics are getting harder. And I’m not sure any of them need more stuff. They do need more focus, however. So Katie and I are grateful that Advent will enrich each of their lives. And that with Mary and with us they will be humbled by the mystery of the incarnation. Download John Piper’s Good News of Great Joy for free. There are brief devotionals for each day until Christmas. Listen to Unto Us a Child is Born. Get the London Philharmonic version and play it really loud. Buy four candles. Light one each week until all four burn brightly by the 22nd. Be quiet and wait. We are doing the Jesse Tree for advent this year. It’s a first.